It’s been a while since I posted an eye look so this is going to be a dramatic glittery eye look best appropriate for a night out! I have used the born pretty store glitters which I reviewed yesterday. The look pretty much ended up looking like the galaxy so that’s how I’m going to name it! 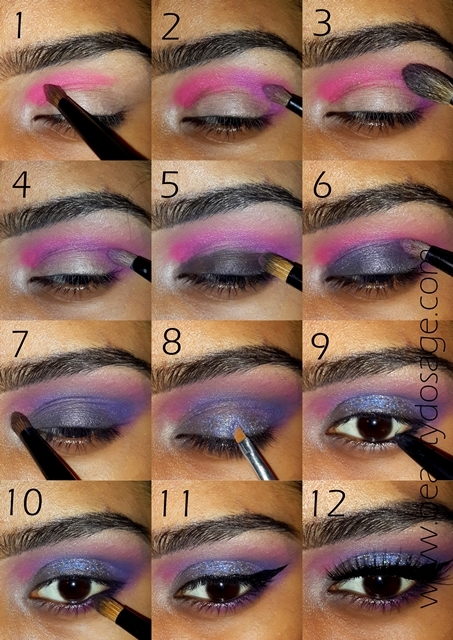 This look has a lot more steps and a lot of blending is a must so let’s get started! 1 Prep your eyes with an eye base I’m using the NYX eye shadow base in skin tone and using a crease brush and a matte Barbie pink shade I’m sweeping it from the inner crease until the middle part of the crease. 2 Now to continue the crease I’m using a dark purple shade with the same crease brush and finishing off the crease. 3 Using a fluffy blending brush with no product on it, I’m blending away the harsh edges and feathering the shades out. 4 I’m deepening the outer part of the eye with a matte black shade. 5 Here I’m applying a black kohl as a base for the rest of the makeup. 6 On top of the base I’m applying a shimmery blue shade. 7 I’m highlighting the inner corners with a shimmery pale gold shade. 8 Now I’m using a blue glitter from born pretty store and applying it on the middle of the lid area with a synthetic brush. 9 I’m lining the inner rims of my eyes. 11 I’m drawing an extended wing on the upper lash line. all my lovely colours in one make up! great! Wow its very nicely done love your eyeliner.